Lately I've been spending a great deal of time working on ways to generate my own electricity. It isn't a necessity for me yet, but someday being electrically self-sufficient could really come in handy. 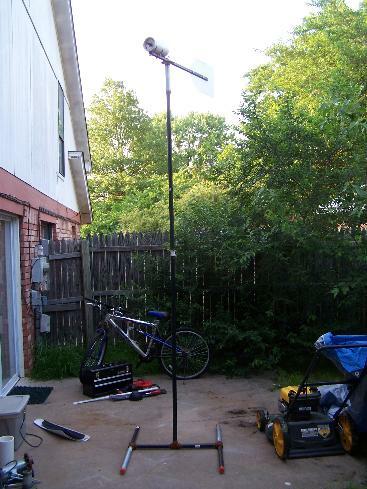 My interest started a while back when I stumbled upon a how-to article on building wind generators from treadmill motors and PVC pipe. It sounded easy enough, so I decided to try and design my own. 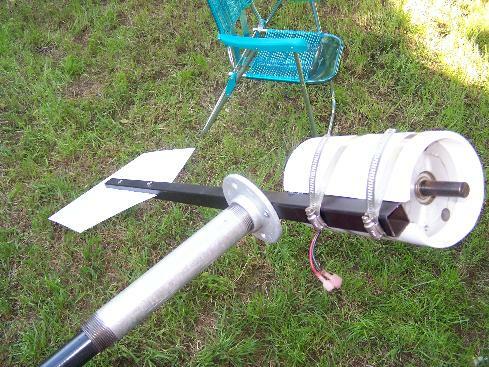 This particular design can be built for $100-$150 if you are thrifty and can regularly generate 50-250 watts (considerably cheaper than a solar panel of similar power output). 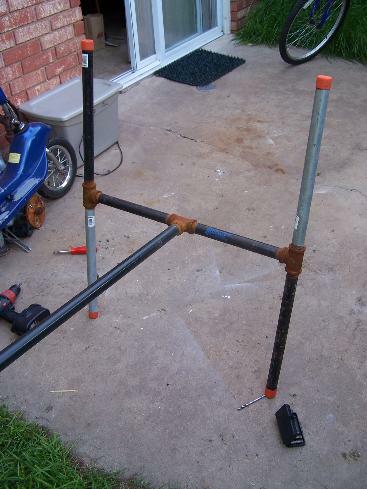 Here's how I built it for those of you who are interested. Additionally, please check out my new frequently asked questions page for more information not discussed in detail here. Before we get into the details of how to build one of these, here are some videos of it in action. Each one demonstrates the behavior of the generator in a different blade configuration. 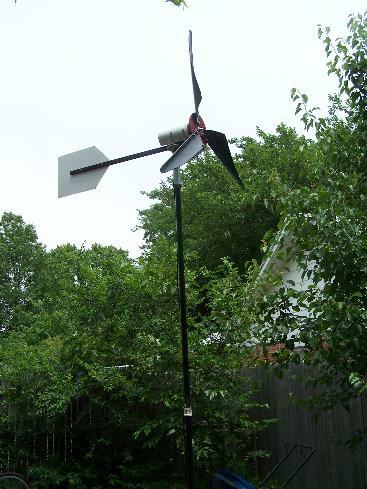 How does my wind generator work? All of the above parts (with the exception of the motor), can be picked up in a single stop to any large hardware or home improvement store. For the motor, the most popular types are old tape drive motors manufactured by a company called Ametek. The key is to finding a motor that puts out the highest voltage per RPM. For instance, the Ametek I'm using is rated for 30V at 325 RPM, making it excellent as an electricity generator (for a nice output comparison of the Ametek motors commonly found on eBay and other sites see TLG Windpower). However, pretty much any permanent magnet motor with a good volt/RPM ratio will do. Keep in mind that if you want to generate useful electricity, you will need to produce at least 12V to charge deep cycle batteries or run an inverter. 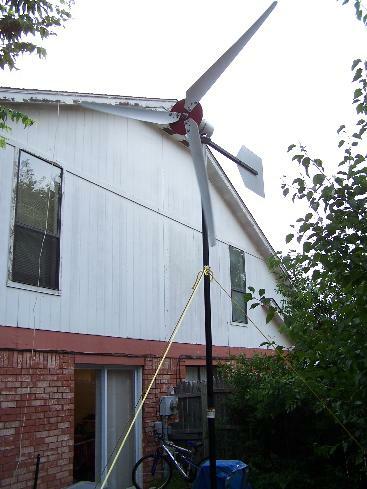 My setup can easily achieve 300-400 RPM in a pretty average wind (for Oklahoma). These instructions assume an Ametek motor with a 5/8" shaft, but can easily be adapted to other motors (search ebay for "wind generator" and you will get a listing of lots of good motors). Cutting the blades for this machine is very simple. 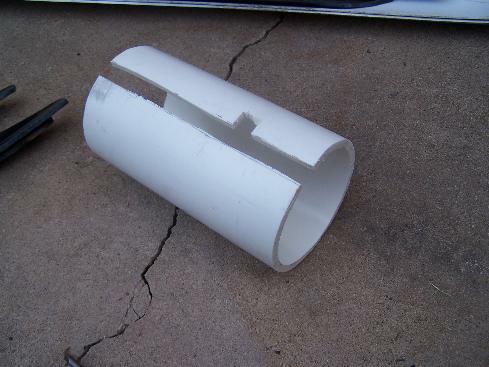 You will need to cut your PVC pipe into 3 sections, two 150 degree sections and one 60 degree section (I've attempted to illustrate this VERY APPROXIMATELY in my favorite CAD program--and by CAD program I really mean MS Paint). The red lines are cut marks. You will want to use a good tape measure and possibly some construction paper or newspaper to mark everything before you cut. The 150 degree angles will result in wide blades that start up in lower wind speeds, however this will lower the shaft turning speeds. In practice, you will find that the optimum angle could be anywhere from 75-150 degrees. 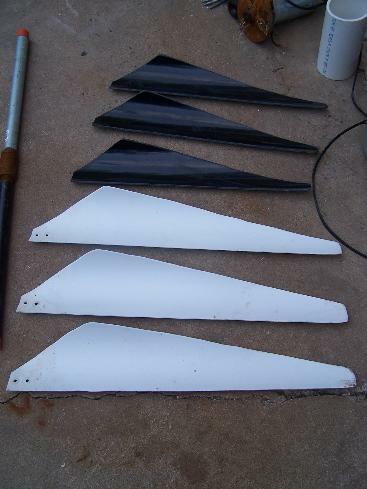 The best idea is start out with a wide set of blades that you can always thin out later if you need to. Remember, measure twice and cut once! It's a pretty simple idea, but circular sawblades have worked out very well for me as hubs. Be sure and get some sort of rubber covering for the tooth edges and/or file down the edges as best you can, because the last thing you want is a hub of death flying at you if your generator decides to rip apart! 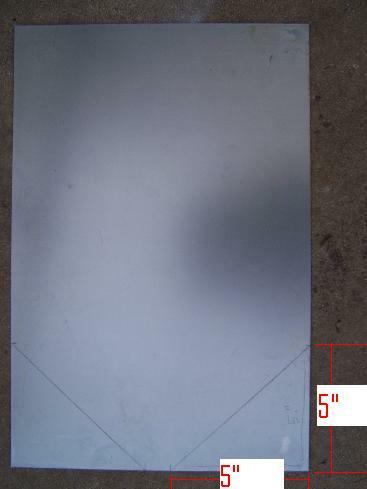 First, I recommend cutting the sheet steel with a jigsaw into a nice design for the the tail (Note: this step is quite unneccessary and ONLY for aesthethic reasons). We then want to make a cut down the center of the square tubing. The length of the cut isn't that important, but I recommend about a 9" cut (this will help make balancing easier later on). 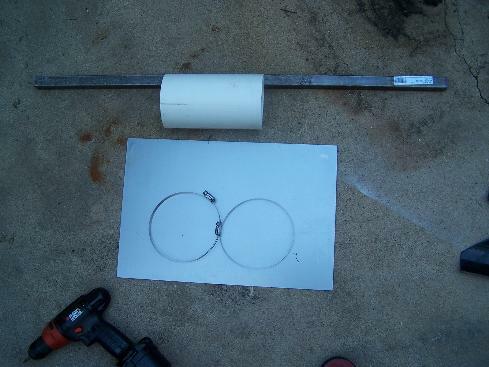 We may then slide the tail metal into the hole and use the 1/4" drill bit to drill and attach the tail to the square tubing. We will then want to cut out a weather covering for our motor. A piece of 4" PVC slips perfectly over the Ametek 30V motor that I use. I cut it out like so (note the side hole for the motor wires). 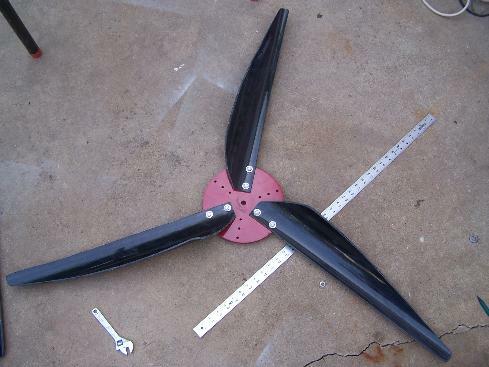 Here is a picture of the experimental design using six blades. 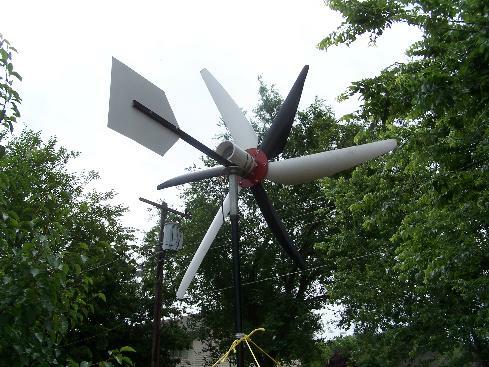 It would spin in practically no wind, but would never get past 100RPM. At least it looked interesting! Here is the battery bank I'm feeding into in parallel with solar panels. 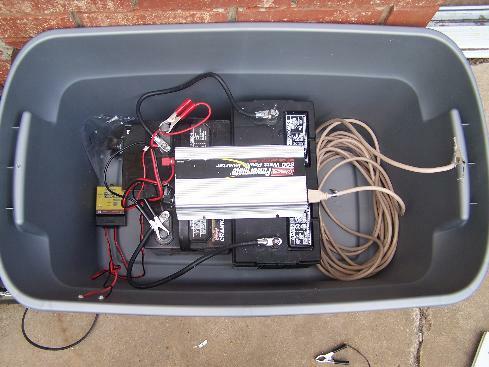 I am just using two 12V marine deep cycle batteries that can be found at any place that sells car batteries. I keep them in a standard plastic tub with a hole cut in the sides for 12V fans I cannibalized from a couple of old Mac G4s (not pictured). Be sure and put a diode between the battery and the generator so that current doesn't flow from the battery to the motor. 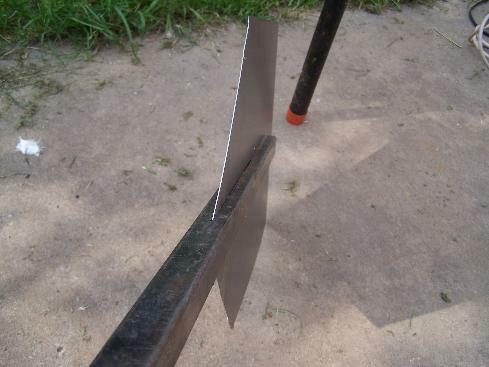 It turns out, cutting the blades a little thinner works better for my area. 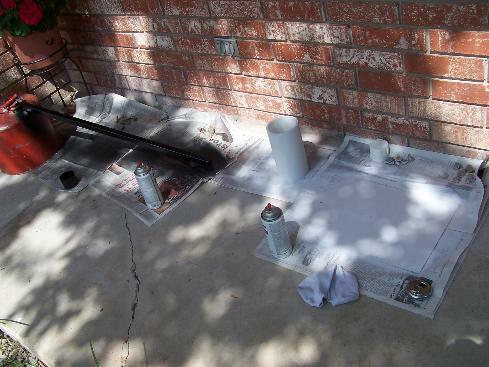 So I used the large white blades from the previous picture and thinned them out a bit. This resulted in the fastest shaft speeds as seen in first video at the top of this page. Not too bad for a 22 year old kid from Oklahoma eh (or at least 22 in 2007)? Please feel free to use my contact form if you have any questions, and of course I will gladly welcome your feedback positive or negative.